A comedy. A horror-thriller. An action-adventure. Go Goa Gone is all of these rolled into one! A unique combination of fear and funny makes this film a one-of-a-kind genre bender - A Zombie Comedy, or ZOMCOM! Hardik and Luv are two dope heads who tag along to Goa with their best buddy, Bunny, on his business trip. Luv comes across a free-spirited girl, Luna who casually invites them to an exclusive underground rave party on a remote island! The party is the brainchild of the macho Russian Mafioso, Boris, to launch the ultimate party drug. But something is not right on this island! All of a sudden, they are accosted by zombies! Where did these zombies come from? And who is Boris really? And why has this cold-hearted drug-dealing don come to save their lives? Together they need to get the hell out of the infected island! But do they? 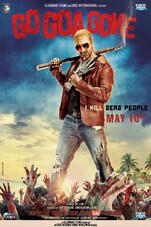 Go Goa Gone is full of surprises: it is as if Delhi Belly on acid has strayed into Zombieland. It is anything but a mindless zombie film. It is visceral yet humorous; over the top yet perfectly controlled. Go Goa Gone is only mildly scary, but it is often very, very funny. What works is its refusal to pull back and away from its chosen course. It goes all the way down the path to the bitter end, even at the risk of turning far too jokey to be effective. Pretty much the same could be said of the film as a whole – it’s crazy but cool. It gives you what you least expect and in ways that you least anticipate. That is a rare attribute for a Hindi film. GO GOA GONE is experimental since something like this has never been attempted earlier. But it's fun, witty, amusing and yes, thoroughly entertaining. The youngistaan is sure to love this mad, mad, mad ride! Go Goa Gone is a must one time watch. Stomping off a naïve horror concept in India, borrowing from a hit Hollywood formula, it is an unabashedly crazy film with Vir Das and Kunal Khemu delivering super performances. Relegated into the premise, the film is an exuberantly hilarious laughter riot that shouldn’t be missed. Honestly, I haven’t laughed this much in a film since Delhi Belly. Take a break from all the morose things in life and catch this one, believe me there can't be any regrets! Had the laugh riot the film induces in the first half persisted obstinately, the film would easily have been invincible!